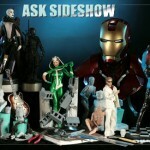 Sideshow Collectibles continues to pump out more Q and A sessions. This time we find out about a certain Rebel Pilot and more hints are dropped as to whom will be the first Joe female figure to grace the 12″ format. No one was named specifically at this time but we do know we will see a female character soon. We also find out the status of the Universal Monsters license.Here is an excerpt of this weeks column and of couse click the headline of the story for more. Q-Any ideas on when we will see female G.I. 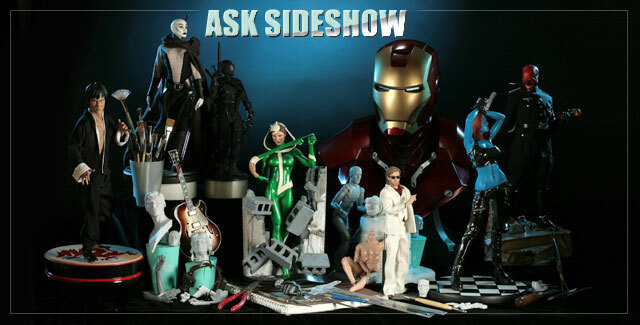 Joe characters in Sideshow’s 12 inch-line? Any hints on who they may be? A-You could probably guess who, but we expect that the first female figure(s) will be revealed within 2010 and released in 2011. Q-You announced during Comic-Con 2009 that you will be releasing Premium Format Figures from “Indiana Jones And The Temple Of Doom“. Now, since you’ve already released two Indy PFs, this could might as well mean Mola Ram, Willie Scott or even Short Round, but I have to ask ’cause I simply cannot wait any more! Is there a Temple Of Doom Indiana Jones INDY PF on the way? A-Yes, we are in development on Indiana Jones from Temple of Doom in Premium Format. Q-Are there any plans in developing a 1/4 scale Ghost Rider Premium Format Figure? Although the character has been used in a variety of formats, I feel we still have yet to see the definitive GR piece. I would love to see your development team go for broke with a light up function or 1/4 scale motorcycle! A-Yes, Ghost Rider is on our list of characters to tackle, although he’s not yet in development. Q-Have you ever though about re-releasing some of the long sold out Premium Format figures and Life-Size busts? Perhaps with minor differences, so that the original items will still retain their value and collectability, but new fans and those who missed out will get a chance to own them? Some items are so rare and coveted you cant find them for sale anywhere for any price! A-We don’t have any plans to resurrect sold out items in new sizes exactly, but we do enjoy the opportunity to revisit long-sold-out characters in new, interesting ways and interpretations. Some of the older (and newer) items are definitely grails, and we wish you luck in your hunt, but we wouldn’t want to do anything to devalue those products. Q-Are we ever going to see any Marvel Zombies items? A Zombie Venom premium format figure would simply be too awesome to imagine, and don’t even get me started on a Marvel Zombie Life Size Bust! There would be no need to eat my “Brrrraaaiiiinnnssss” as they would have exploded at the announcement!!! A-While it is possible in the future, Marvel Zombies are not currently part of our planning. Q-Your range and quality of Marvel products is incredible! In particular, I am fan of the Legendary Scale Bust series. You’ve mentioned in previous “Ask Sideshows” that we can expect more from this series. However, will we see more of the unique little extra’s that appear on some statues, such as light-up features and removable mask type features? These features add an even greater dimension to these already amazing statues! Keep up the good work. A-Thank you, thank you! Absolutely, we’re always looking for ways to increase the interactive qualities of our products, including the LSB line. Some of the up and coming LSB’s should definitely excite you! Q-I was wondering, now that Disney has acquired Marvel…. is there going to be changes in the Marvel licensing, like versions, characters, and any other things? A-To be perfectly honest, we’re interested to see how things develop too. We don’t anticipate any radical changes, but it may open up some interesting new frontiers. Q-I’m a big fan of Wedge Antilles and believe that he has pretty much gotten the shaft in the world of Star Wars collectibles! Any chance on Sideshow doing him some justice and giving us a 1/6 Wedge? A-Yes, we’re actively reviewing the Rebel pilot roster for 12″ figure development. Wedge is at the top of that list. Q-I am confused over the answer you gave concerning the question regarding the Darth Vader life-size bust. I was at Comic-Con and pointed out that the stand should be one that lets the face mask be displayed be itself WITHOUT the dome over the face mask because all that great detail on the mask will be covered up by the dome over it. There is so much detail in that face mask it would be an injustice not to see it if the dome has to go over the face mask! A stand should be created for the face mask AND a stand for the dome—SEPARATELY!! I hope this is what is being planned! A-Understood - and we’ll show images very soon of the way that the separate display base allows you to display the facemask and dome. They’re not going to display in a connected fashion (as when they’re dressed on the bust), so that some of that detailing on the facemask is in fact visible. Stay tuned! Q-I ordered your Darth Vader Life-Size Bust, and I have a question about this. It is possible to put the head of Anakin Skywalker with the mask and the dome at the same time on the life size bust? I find that it would be something very interesting to be able to have three elements positioned at the same time on the life size bust of Darth Vader. Thank you in advance for your answer. A-We gave it a great deal of consideration but found that any solution that allowed you to dress the mask over the Anakin portrait would in fact impeach the quality of the Anakin portrait by forcing us to flatten his ears, reduce the size to easily fit, or to make some other compromise that felt wrong. As it is designed, you will have to choose whether to display the Anakin portrait OR the facemask (with or without the dome). Q-Are you planning on making a Queen Amidala Premium Format figure anytime in the near future? I’ve been waiting forever for one and it doesn’t seem to come up at all in questions or anything! A-You’re not the only voice to ask this recently. She is on our list of candidates but not yet in development. Q-GOD OF WAR 3 Premium Format Figures would rock. Will we see this in the near future? A-We are actively developing for God of War, and do hope to offer a modest line for the property. Q-Your Premium Format line is fantastic, is there any chance we will see a Cave Troll in this format? And how about a Fell Beast in Legendary Scale Bust? A-Both are excellent suggestions and do appear on our candidate rosters, but neither is currently in development. Q-After seeing the Commander Cody Legendary Scale Bust I was so excited! But I was wondering if we will ever see any Alien or Predator legendary scale busts? A-Yes, we do expect to bring Alien and Predator characters to life in the LSB form in the future. Q-In the 9/23 Ask Sideshow you told us that there where some problem getting the likeness of the Aliens characters because the studio doesn’t have the likeness rights (hope you’ll get the rights some day in the future…) anyway, it seems you do have the rights to use Arnold Schwarzenegger likeness for the Terminator franchise…so is there a chance then to get some Premium Formats from the first Terminator film, I’m thinking Schwarzie and a Michael Biehn/Kyle Reese PF (tough if the Studio hasn’t the right for Biehn it would be the same problem as for Aliens). A-With older films (counting all things pre-1990 as older), the studios are often unable to provide likeness rights for the principal actors - it simply wasn’t common practice to sign those rights for merchandising potential. Yes, we are interested in creating likeness products of Arnie and Biehn, and we will keep you updated (probably in the form of a product announcement… or not… using their likenesses). Q-You announced during Comic-Con 2009 that you will be releasing Premium Format Figures from “Indiana Jones And The Temple Of Doom”. Now, since you’ve already released two Indy PFs, this could might as well mean Mola Ram, Willie Scott or even Short Round, but I have to ask ’cause I simply cannot wait any more! Is there a Temple Of Doom Indiana Jones INDY PF on the way? Q-With all the classic horror characters that have been depicted by Sideshow, will we ever see Sideshow adding products depicting Hannibal “The Cannibal” Lecter to the offering? A-We do review Hannibal Lecter from time to time but have yet to begin any development. Q-It’s been a while since Sideshow offered anything new for the Universal Monsters. Can we expect any new busts, dioramas, Premium Format or 1/6 scale figures? What about a line of prop replicas (Dracula’s ring, Im-ho-tep’s scarab ring, the Wolf Man cane and medallion, a fossilized Creature hand)? A-Yes, we are returning to Universal Monsters with a fairly fresh approach. It’s not likely that we’ll tackle prop replicas - we’re a bit more interested in realizing the characters at the moment. Q-I’m sure you are very aware about the comments on Rambo Premium Format Figure, and like most people, I was disappointed with the prototype photo. I was hoping for a more intense pose and a better likeness, but I was not as upset as many others were. I still think it looks okay except for the base. I thought it could have been so much better…. Simple bases like King Leonidas and Patient Zero are perfect and I wish Rambo had a better base. And for some reason I think the gun is too thin. It looks the right proportion but just a bit on the skinny side. Anyway, I know you heard our cries before, but considering how iconic this character is, I was surprised you didn’t use Trevor to sculpt the likeness. I truly hope you guys work on him a bit and make him as good as your T-800, Conan and Indy PFs. Oh, and don’t forget that 5 o’clock shadow! A-We will certainly share your comments with the creative team, but to the best of our knowledge, Rambo is moving ahead as-is for production. Q-The three Hot Toys Gorillas are fantastic sculpts (looks like James Gregory under the makeup) and the hair is much preferred over the sculpted hair (Hot Toys really nailed 1:6 hair!) I would like to see more Gorilla soldiers in different uniforms, even on a horse, to make a POTA scouting party collection! A-We will definitely share your suggestion with Hot Toys!